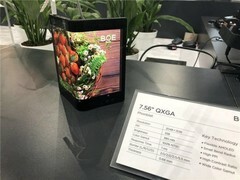 The video shows foldable displays from BOE. A video leaked in September last year showed what seemed to be a smartphone prototype with a bendable display from BOE. Apart from that clip, there was no further information about the foldable displays from the Chinese manufacturer that could possibly turn out to be a tough competitor for Samsung & co. Now, there is a new video that shows two new foldable displays from BOE. The race to release the first mass-market foldable smartphone is coming to a head. It's believed that Samsung has the most advanced technology, but its Chinese competitors are starting to gaining some ground. Presently, there are only a few foldable-display manufacturers out there, and while Samsung is producing its own panels, Chinese smartphone producers have to rely on parts from external screen manufacturers. Currently, the one Chinese company that is capable of producing foldable displays is BOE, but information on its products is generally hard to find. However, last September there was a video leaked that showed the prototype of a foldable smartphone, and now there is a new video available showing some interesting foldable technology. The latest video leak shows two foldable displays: a 5.99-inch one and a bigger 7.56-inch screen. They are supposed to be WQHD AMOLED displays, but the focus is on durability and the small bend radius that should only be 1 mm. Apparently, the panel can be folded by at least a minimum of 100,000 times. The overall picture quality, as well as whether the screen shows color degradation within the bending area, cannot be accurately rated due to the poor quality of the video. It's likely more information about these Chinese displays will be made available soon.